The Temple of the Warriors complex consists of a large stepped pyramid fronted and flanked by rows of carved columns depicting warriors. This complex is analogous to Temple B at the Toltec capital of Tula, and indicates some form of cultural contact between the two regions. 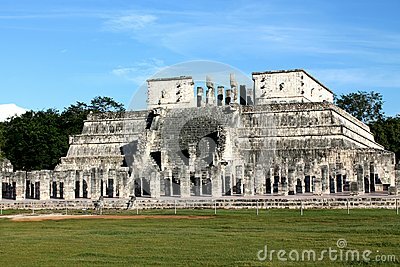 The one at Chichen Itza, however, was constructed on a larger scale.